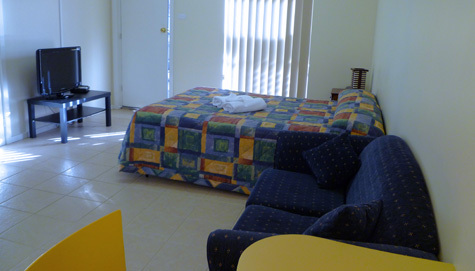 Our Studio Apartment Accommodation sleep two people and feature a large, open-plan living area with a queen size bed, sofa, dining table & chairs. 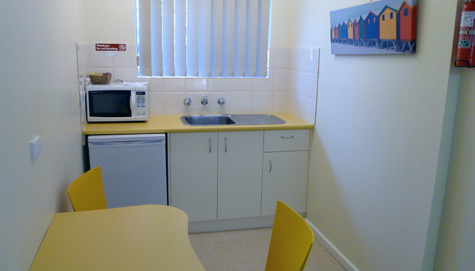 The kitchenette includes basic cooking facilities (microwave oven, electric fry pan and small refrigerator) while the separate bathroom has a shower and vanity, hair dryer, iron and ironing board. You have access to our guest laundry. 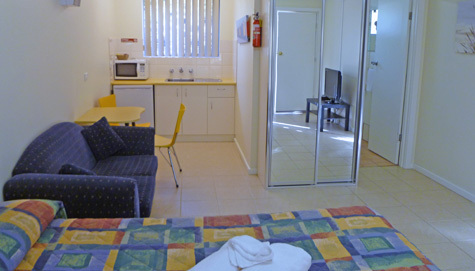 Enjoy Free Wi-Fi, Flat Panel TV a DVD Player and free access to Netflix™ , while the reverse cycle airconditioning keeps the apartment comfortable all year-round. 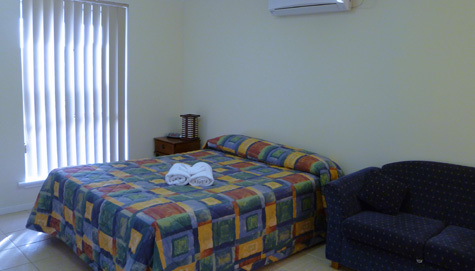 Visit our indoor heated pool and spa, or cook on the modern indoor guest BBQ kitchen, which offers facilities for large or small groups. The room rate quoted is for 1 or 2 people.